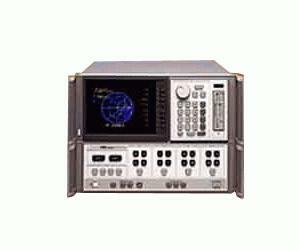 This 8510XF system (Agilent E7350A) has been designed to measure broadband devices to 110 GHz in coax (1.0 mm) or on-wafer, fully calibrated, in a single sweep. By building on the Agilent 8510C network analyzer, the Agilent 8510XF provides excellent measurement performance in frequency coverage, dynamic range and measurement accuracy. All frequency band switching is performed internally by the Agilent 8510C, making it extremely convenient when measuring broadband devices on-wafer or in coax.